Can you have a healthy weight gain during pregnancy? Eating healthy before conception and throughout pregnancy is one of the best things you can do for yourself and your baby. Good nutrition optimises the growth and development of your baby and safeguards your own health. During pregnancy, your energy requirement increases by about 300 kcal a day, which is not much compared to the average non-pregnant Singapore woman’s requirement of 1700 kcal a day. On the other hand, requirements for other nutrients (e.g. protein, folate, calcium, vitamin D and B vitamins) may be significantly higher than in the non-pregnancy state. As such, you should make smart choices by choosing a variety of nutrient-dense foods, rather than just eating more food! This is especially so if you now experiencing a smaller appetite. Folate is vitamin B, which is essential for cell division and organ formation. This nutrient helps prevent neural tube defects (malformations of the brain and spinal cord) in your developing baby and anaemia in pregnant women. Due to the severe nature of neural tube defects, we strongly advise adequate folate intake of at least 800 micrograms daily before conception and throughout the first three months of pregnancy. Dark green vegetables, for example, spinach, broccoli and asparagus; citrus fruits and juices, yeast extract, liver, dried beans and fortified breakfast cereals — are rich in folate. Care should be taken, however, to avoid overcooking the vegetables as folate is easily destroyed by heat. Folic acid capsules are sold at your local pharmacy. Iron is needed for the formation of red blood cells. Inadequate iron intake may lead to anaemia. This is because, during pregnancy, your blood volume expands to accommodate the changes in your body. Moreover, your unborn baby also needs to store adequate iron for the first six months of life before he/she starts consuming solid foods. There are two forms of iron in foods — heme and non-heme. Heme iron is better absorbed by the body than non-heme iron. Sources of heme iron include red meat, liver, chicken and fish. Sources of non-heme iron include egg yolk, green leafy vegetables, iron-fortified breakfast cereals, dried fruits and nuts. To enhance the absorption of non-heme iron, consume vitamin C-rich foods (namely, fruit and vegetables) at the same meal or take vitamin C supplements. This vitamin is required for blood formation. It is only found in foods of animal origin, namely, meat, poultry, fish, milk and eggs. Vegans (vegetarians who do not eat any animal products including eggs and milk) must take vitamin B12 supplements in order to meet the daily requirements. DHA (Docosahexaenoic acid), one of the omega-3 fatty acids, found in cold water deep-sea fish, is important for brain and eye development. Studies have shown that pregnant women who eat cold water fish have babies with higher IQ and better vision than pregnant women who do not. Unfortunately, large deep-sea fishes may contain methylmercury, a heavy metal that is toxic to the developing fetus’s neurological system. Hence, the US Food and Drug Administration recommends that pregnant women eat a maximum of 12 ounces (3 servings) of a variety of cooked fish or shellfish per week, and avoid shark, swordfish, king mackerel (known as “batang fish” locally) and tilefish (also called white snapper). Although tuna is a good source of DHA, albacore tuna (found mainly as canned white tuna) is higher in methylmercury than other types of tuna (e.g. skipjack, bigeye and yellowfin, commonly used for canned light tuna), hence pregnant women are also advised to limit albacore tuna to one serving a week. Safe DHA-rich sources include salmon, sardines, herring, halibut, canned light tuna and omega-3 fortified eggs. Alternatively, you can ask your doctor to recommend a suitable DHA supplement (300 mg a day). The function of vitamin A is to promote growth of cells and tissues, and prevent night blindness. However, excessive intake of vitamin A above 10,000 IU daily in the first trimester can cause birth defects. Hence, in the first trimester, pregnant women should obtain their vitamin A from food rather than from supplements, and limit liver intake to two tablespoons (50 g) per week. Good sources include eggs, milk, deep-red and yellow fruits and vegetables (for example, papaya, mango, pumpkin, carrots) and dark-green leafy vegetables (for example, spinach and broccoli). Both you and your baby need calcium for strong bones and teeth. Excellent sources of calcium are milk, cheese and yoghurt. Other foods that contain calcium are beancurd (“tauhu” and “taukwa”), green leafy vegetables, ladies fingers, small fish with edible bones such as “ikan bilis” and sardines, and calcium-fortified soymilk and fruit juice. Vitamin C is required for collagen formation in bones, muscles and blood vessels. The Singapore RDA for vitamin C intake in pregnancy is 50 mg a day, whilst the US recommendation is 85 mg a day. It is recommended that pregnant women obtain their vitamin C from food rather than from supplements, as there have been reports of rare cases of ‘rebound scurvy’ occurring in infants born to mothers taking 400 mg or more of vitamin C throughout their pregnancy. “Rebound scurvy” occurs when the infant becomes tolerant to the high dose of vitamin C from the mother during pregnancy, hence it develops symptoms of scurvy or vitamin C deficiency after birth. Both our Healthy Diet Pyramid for Pregnancy and the Health Promotion Board’s My Healthy Plate recommend two servings each of fruits and vegetables, which can meet the pregnancy requirements (Table 25.2). In general, all types of fruits and vegetables are safe if consumed in moderation. Vitamin D helps with calcium absorption. Food sources include fortified milk, margarine and cold water deep-sea fishes, e.g. salmon and sardines. Apart from foods, our bodies can also synthesize vitamin D when exposed to sunlight. Spending 10 to 15 minutes twice a week outdoors is sufficient for our bodies to synthesize enough vitamin D to meet our requirements. What to Eat and How Much? 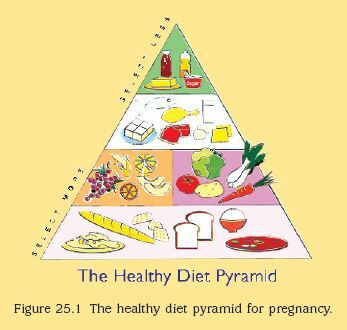 The Healthy Diet Pyramid for Pregnancy is a useful guide for pregnant women to plan out their daily diet. It enables you to obtain all the important nutrients required to support a healthy pregnancy. Figure 25.1 provides more information on how to use the healthy diet pyramid. At the tip of the pyramid are fats, oils, sugar and salt. Use in small amounts to enhance the flavour of foods. Raw and undercooked animal foods contain a variety of food-borne bacteria and viruses. Changes in your metabolism and circulation during pregnancy may increase the risk of bacterial food poisoning, and your reaction may be more severe than if you were not pregnant. Herbal products have not been studied enough to be recommended during pregnancy. Do consult your doctor if you are planning to take these herbs. Mothers who drink alcohol have a higher risk of miscarriages and stillbirth, and excessive alcohol consumption may result in fetal alcohol syndrome, including facial deformities, low birth weight and mental retardation. Unwashed salads may be contaminated with bacteria from the soil, while raw vegetable sprouts contain high levels of germs, which can be harmful to health. As a general guide, you can use your rate of weight gain as an indicator of whether you are eating enough for both yourself and your baby. Gaining the appropriate amount of weight in pregnancy ensures that your baby is of good birth-weight and also means that you do not have too many extra kilos to shed after delivery. How much weight you need to gain depends on various factors including your pre-pregnancy weight, your health status and whether you are carrying a single baby or twins/triplets. You can discuss with your doctor to determine how much weight you should gain. Most pregnant women should expect a weight gain of 10–12 kg throughout the entire pregnancy. The weight gain of the mother is mainly due to the increased water retention, thus, maternal weight gain does not necessarily correlate well with the baby’s weight at delivery. If you are carrying twins or triplets, you will need to gain more weight. Work with your doctor to determine how much weight you should put on. If you have gained more weight than recommended, do not try to lose weight. It is never safe to lose weight during pregnancy as both you and your baby need nutrients for growth and optimal health. You may aim for a slower rate of weight gain. Work with your doctor or request for a referral to a dietitian to plan out a suitable meal plan. Diabetes during pregnancy increases the risk of certain health problems like high blood pressure during pregnancy (pre-eclampsia), big baby leading to a difficult delivery and higher chance of needing a cesarean section. Hence, it is important for women with pre-existing diabetes before pregnancy, and those newly diagnosed during pregnancy (i.e. gestational diabetes) to control their blood glucose levels. This will minimise the risk of developing these problems. There are three steps to manage diabetes during pregnancy, namely, blood glucose monitoring, diet and insulin (if blood glucose levels cannot be controlled by diet alone). Apart from controlling blood glucose levels, the diet should also provide adequate nutrition for the pregnant mother and her baby, resulting in appropriate weight gain similar to that for non-diabetic women. The diet for diabetes during pregnancy is similar to the healthy diet recommended for all pregnant women, except for the regular distribution and consistent intake of carbohydrate-containing foods (e.g. rice and alternatives, starchy vegetables, fruits and milk) throughout the day. In other words, you can have three meals and three snacks, with the same amount of carbohydrate-containing foods daily at each meal and snack. Contrary to popular belief, there is no need for pregnant women to consume glucose or any other sugars for energy, as carbohydrate foods are digested into glucose by the body. Hence, sugars and sweet foods are not recommended for pregnant women with diabetes, as they are high in carbohydrates, leading to high blood glucose levels, which are often low in nutrients and high in energy, leading to excessive weight gain. The guidelines for the diet for diabetes during pregnancy can be summarised in Table 25.4. Please see your dietitian for a meal plan specific to your needs. For the women suffering from long-standing essential hypertension (even before pregnancy), anti-hypertensive medications and a low-salt diet are advocated to help treat this condition. In hypertension that arises only during the course of the pregnancy (gestational hypertension or preeclampsia), the only definitive cure for this condition is through the delivery of the baby and the placenta (read the article Pregnancy Complications). However, while not a cure for pre-eclampsia, limiting your salt intake is advised. People with PKU have a deficiency of an enzyme, which is necessary for the proper metabolism of an amino acid called phenylalanine. Serum phenylalanine level at conception is critical to the organ development of the fetus. Elevated maternal blood levels of phenylalanine may cause spontaneous abortion, brain and heart defects, poor fetal growth, as well as mental retardation in the baby. If maternal blood levels of phenylalanine are optimised by special diet prior to conception and during pregnancy, this risk to the foetus is markedly reduced. It is important for any woman with PKU who is contemplating pregnancy to understand this. If you are underweight before pregnancy, or not putting on enough weight during pregnancy, you can still follow the Healthy Diet Pyramid for Pregnancy. Increase the number of servings consumed from each food group. Snacking on healthy snacks like nuts, dried fruits, cheese, desserts (tauhuay, tauswan, red bean soup) in between meals. Drinking 1–2 cups of soybean milk, fruit juice, malted milk drinks (e.g. Milo, Ovaltine, Horlicks), on top of plain water. Frying your foods in mono or polyunsaturated oils (e.g. olive, canola, sunflower, soybean oils) to increase energy intake from good fats. Drinking nutritional supplement drinks formulated for weight gain (e.g. Ensure, Nutren Optimum, Enercal Plus, Resource, Fortijuice). Please discuss with your doctor if you have concerns about your weight. Related: Canola Oil, Olive Oil, Soybean Oil, Is There a Difference? If you are overweight in pregnancy or have put on too much weight during pregnancy, there is a higher risk of developing diabetes during pregnancy. Moreover, you may find it more difficult to lose the extra weight after delivery. Thus, it increases the risk of obesity-related conditions like high blood pressure, diabetes or heart disease. Follow the Healthy Diet Pyramid for Pregnancy, but control the number of servings consumed from each food group to the lower end of the recommended range, i.e. consume six servings of rice and alternatives, and two servings of milk and dairy products. Limit your fat intake by cutting down on high-fat foods, e.g. fried foods, foods cooked with coconut milk, nuts, fast foods, cakes, biscuits, pastries, snack foods (e.g. potato crisps, prawn crackers) and changing to skimmed milk and non-fat dairy products. Limit your intake of sugar and sweet foods e.g. sweet drinks, sweets, sweet desserts. Have plain water when thirsty, and have fresh fruit after a meal instead of dessert. Increase your fibre intake to help reduce hunger e.g. change to wholemeal or multigrain bread instead of white bread, have two servings of vegetables for lunch and dinner so you will feel less hungry after meals, and choose low fat high-fibre snacks in-between meals when hungry (e.g. boiled chickpeas, fresh fruit, red bean soup, oats, steamed corn). Increase your fluid intake. Drink at least eight glasses of fluid (including two glasses of skimmed milk) a day. Drinking a glass of water or a bowl of non-cream soup before meals also helps to fill you up, and take the edge off your appetite. Remember, you should not go on a diet to lose weight when you are pregnant. Instead, focus on eating healthily to control your rate of weight gain so that both you and baby will have optimal nutrition. 1. Is it safe to fast during pregnancy? There are certain concerns with regard to fasting in pregnancy. You may experience hypoglycaemia (low sugar level) with fainting spells as well as giddiness. Also, when fasting is prolonged, the health and growth of the developing baby may be affected. Thus, discuss with your doctor first if you are considering to fast for period or religious reasons during your pregnancy. 2. Can I eat durians during pregnancy? Durian contains high calories as well as potassium salt. Thus, do eat in moderation or you can gain excessive weight. 3. I have high cholesterol level during pregnancy. Is this a problem? Pregnancy causes an increase in the blood cholesterol level. This is a normal adaptive response to pregnancy as an ample supply of cholesterol is necessary to maintain fetal development. 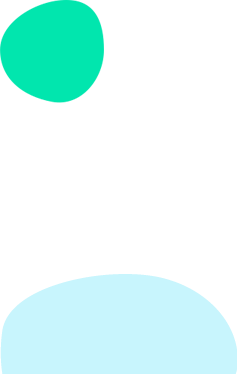 This level usually normalises several months after delivery. There are no conclusive studies that show harmful effects of high cholesterol levels to the mother or the developing baby. However, as a high cholesterol level is a risk factor for heart disease and stroke in the long term, we advise you to look into changing your lifestyle if your cholesterol level remains high after delivery. Consider a diet low in cholesterol, consisting of bread, fruits, vegetables and small amounts of lean meat, fish and olive oil. Avoid smoking. See your doctor regularly to check your cholesterol level.